I understand. While first-days-of-school can be filled with excitement, new school supplies, and the hope of better things, school routines can feel stifling after weeks of unfettered exploration. No more time for “messing around.” It is time for the serious business of school. 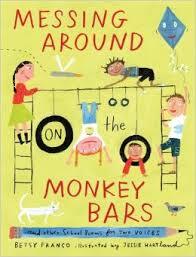 Maybe that is why the book Messing Around on the Monkey Bars made me chuckle so. Betsy Franco’s collection of school-based poems for two (or more) voices remind us that imagination can be alive and well and living at school. Each poem is structured for choral reading, with lines for Voice 1, lines for Voice 2, and lines for both together. Of course they can easily be adapted for larger groups. By a beast with wheels. Doesn’t that sound like the school bus experience? of students trying to be quiet in the library to the incessant “tap tap tap” of pencils. Imagine the two parts of “Backboard Rap,” with the first voice in the left column and the second voice in the right (bold) one speaking simultaneously. Here’s the first verse. bounce bounce Pass to Trish. bounce bounce Shoot a basket. bounce bounce Hear the swish! bounce bounce Pass to Vin. bounce bounce Up and in! As you can tell, Messing Around on the Monkey Bars, is fun, but can also be used to teach poetic devices from onomatopoeia to personification. For older students, it can be a non-stress way to introduce or review such terms, and perhaps offer a challenge to use similar techniques to create their own school-poems—either poems for younger children, or perhaps a collection of the sights and sounds of middle or high school. For younger children, the book offers models for their own poetry, and plenty of inspiration. As I contemplate moving on to work on my online graduate courses, I have to wonder, what would a poem about online learning look like? Anyone want to write one? « Solar Balloons: Creative Science That’s Fun!